CES 2015: Kube is Bluetooth speaker and cool box | What Hi-Fi? Kube – a Bluetooth speaker that will also cool your food and drink – is the result of a collaboration between Polk Audio and Thomas & Darden, and ir might just be the ultimate party accessory. There's plenty of outside-of-the-box thinking on display at CES 2015 and this is one such example - although the action here is very much in the box. Marrying the design knowledge of US company Thomas & Darden and audio expertise of Polk Audio, the Kube is both a no-nonsense Bluetooth speaker and a cool box for food and drink. The portable Bluetooth speaker element can pump out 100db of sound thanks to speakers at either end. And it's happy doing so while full of ice and beer, with a capacity of around 30 litres. The entire box is 23 x 13 inches and weighs around 9kg. A 50ft wireless range and 20-hours of battery life makes the Kube pretty versatile and ideal for taking to the beach or park if you want to be the envy of - and also potentially irritating - everyone around you. There are USB and power inputs on the back, which are covered so as to retain the Kube's waterproof nature. Kube’s components are manufactured in Asia, with final assembly and construction to be completed in an Austin, Texas, where Thomas & Darden is based. 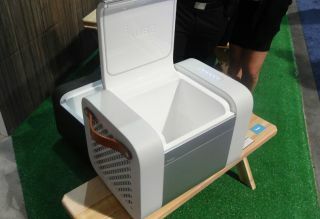 The Kube is due on sale this summer and comes with a price tag of US $1099. Interested? You can see more and pre-order on the Kubesound website.